The ancient Messene was the capital of Messinia. It was near the present village Mavromati in the western foothills of Mount Ithomi entering from Arcadian Gate. Ithomi was the strongest natural and artificial stronghold of Messinia. The city was founded by the Theban general Epaminondas in 369 BC who freed Messenia by the Spartans. Messene reached maximum prosperity during the Hellenistic period. The first evidence of human settlement in ancient Messene go back to the Late Neolithic period (4300-3000 BC) or the Early Bronze Age (2800-1900 BC). In 800-700 BC, the temple of Zeus Ithomata Ithome was in full operation. Located in down town founded the first temple of Artemis Orthia and the earliest Asclepius. The early state of the Messenians is under long Spartan occupation (8th to 5th century BC. ), Recorded in four, known in history as Messenian wars. The third Messenian War (510-490 BC) is connected with the name of the legendary hero Aristomenes. In the 4th Messenian War (464-456 BC) besieged for many years the citadel Ithome, and the revolt of the enslaved Messenians leads to capitulation. The fugitive Messenians settled in Nafpaktos, while in 399 BC expelled by the Spartans and resort in Sicily and Cyrene. After the battle of Leuctra in Boeotia (471 BC) and the defeat of Sparta, the Theban general Epaminondas and Argive allies establish the independent state of the Messenians (369 BC). The new capital was built at the foot of Ithomi, fortified with powerful and imposing city walls, called Messene named after the mythical prodoriki queen. The ancient traveler Pausanias visited Messene (155-160 AD). At this time the city is still an important political and cultural center, with public religious or secular buildings in good condition and retains an unchanged Ippodamius building of tissue. It has, among other things, the rare privilege not been destroyed or covered by younger settlements and is an eminently Mediterranean untouched natural environment. This natural environment combines mountain grandeur of Delphi and low riverine serenity of Olympia, with the dominant bare limestone volume Ithome where the citadel, and low fertile valley around the ancient city. Ancient Messene was protected from the northeast, as a natural wall by mount Ithomi. The rest of the city was surrounded by almighty walls approximately 9.5 km, which one can still admire today. All buildings of Messene have the same orientation, and integrated into the grid produced by horizontal (east-west) and vertical (direction north-south) streets. The urban system is known as Ippodamius from initial inspirer and creator of architects, surveyor and astronomer of the 5th century BC, the Hippodamus from Miletus. Noteworthy is that the predetermined shape is based on the principles of fairness, equality before the law and equal shares, ie the virtues of democracy, characterized by extreme geometrismo, adjusted each time the specific geomorphological and climatic conditions of the country, is harmoniously integrated into the natural environment . Systematic excavation and restoration work of ancient Messene is going on, under the auspices of the Archaeological Society and the direction of Professor Peter G. Themelis. An archaeological site of Ancient Messene means that, enclosed within the fortification. the Archaeological Museum, including Mount Ithomi, the citadel and the sanctuary of Zeus Ithomata near the old monastery Voulkanou or Vourkanou. Also, it includes the sacres of Eileithyia-Curetes and the sanctuary of Artemis Limnatida, on the northeastern slopes of Mt. In the current village Mavromati is the ancient fountain Klepsidra that supplies water to the site today. It had two gates, the Arcadian Gate (or Gate of Megalopolis) and the Laconian Gate. This last gate was destroyed in the 18th century, but the Arcadian Gate is still preserved in fairly good condition. In fact was the city’s landmark for the first travellers, who liked to depict it in their engravings. It is an enormous and imposing circular gate, with two entrances, one interior and one exterior. The main archaeological site is developed on a slope, from north to south. 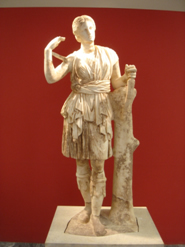 Northwest of Asklepios revealed the first sanctuary of Artemis Orthia, and near it, the sanctuary of Demeter and the Dioscuri, which cannot be visited. Near the south portico of Asklepios loaded inscribed pillar, bearing engraved voted seven cities of Greece in honor of Messinian Damofontos sculptor, who worked predominantly in Asclepeion. Broad Street heads west of Asklepios and ends at the monumental entrance of the Gymnasium of Messene. That was surrounded with three U-shaped galleries in the city stadium, was this single functional and architectural ensemble, where races were held and trained teens. Along the western portico of the Gymnasium developed rectangular buildings, where they had erected great artwork, copies of important sculptors of antiquity, like Hermes, Theseus, Hercules, Doriphoros and more. 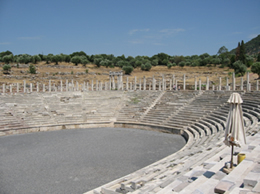 The Theatre of Messene, which only had an indirect reference by Pausanias, was discovered NW of Asklepios and 50 west of the Agora. Constructed in the 3rd-2nd century B.C. and is of the greatest antiquity. The amplitude reaches 98.60m, the diameter of the conductor of 23.46m, it was used for recreation of citizens, but also for political gatherings, as evidenced by epigraphic discoveries. Remains of the basilica were discovered behind the west side of the huge market, and SSE of the Grand Theatre of Messene. The temple, measuring 16 x 38m., It seems that it was built in the late 7th century AD with building material from earlier buildings. The imposing fortification walls of Messene with gates and towers marks the reestablishment of free Messenian state after the battle of Leuctra (371 BC) the Theban general Epaminondas and Argos allies. In 369 BC founded within the walls, at the foot of Mount Ithomi, the new capital of Messene, a homonym of the prodorikis, queen. Pausanias recognizes the supremacy of the fortifications of Messene compared to other famous era. Descending from the village Mavromati meet the museum. 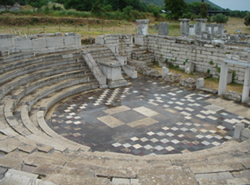 Passing through vineyards and olive groves, we see right in the theater of ancient Messene with towering walls and left the Fountain Arsinoe. Continuing on a narrow trail, we see the market at left side and soon after, the sacred site of Asklepios. This small museum was built in 1970 with funds from the Archaeological Society and plans A.Orlandou. The museum consists of three rooms which are mostly sculptures.